The real name of “Lal Shahbaz Qalandar” was Syed Muhammad Usman who was born in 1177 AD in Marwand , Iran . His father, Syed Ibrahim Kabiruddin, was a virtuous and pious dervish, and his mother was a high-ranking princess. His ancestors migrated from Iraq and settled down in Meshed , from where they again migrated to Marwand. During the Medieval period, Meshed and other cities of that region were renowned centers of learning and civilization. Even as a young boy, Shahbaz Qalandar showed strong religious leanings. He learnt the Holy Quran by heart just at age of seven, and at twenty embraced the Qalandar order of Sufism. “Qalandar” is a type of dervish who is generally dressed in beggarsâ€tm clothes, likes poverty and austerity and has no permanent dwelling. Lal Shahbaz Qalandar wandered throughout Middle East and came to Sind from Baghdad via Dasht-i-Makran. In 1263, he arrived in Multan , which at that time was at the height of glory and splendor. The people of Multan besought him to stay but he continued his journey southward and eventually settled down in Sehwan, then a famous center of learning and popular place of worship for Hindus, in the southern part of Sindh, where he lived in the trunk of a tree on the outskirts of the town. He stayed at Sehwan for six years and during this period he disseminated the light of Islam, providing guidance to thousands of people. Sehwan is probably the town with the oldest continuous existence in Sind.It rises on the top of a conical hill, and nearby lie the ruins of a huge fort believed to have been founded by Alexander the Great. Some coins of Alexander’s time are reported to have been found here. Sehwan was the capital of a Buddhist ruler who was brother of Chandragupta II, the third of the Guptan dynasty in the 4th century AD. From the time of Arab invasion in 712, Sehwan was very important in the history of Sind since it commanded the route from the Upper to the Lower Indus , through which all invaders from either north or south had to pass. And possession of the fort was essential to the success of every campaign. Lal Shahbaz Qalandar is an overwhelmingly popular patron saint cherished and adored alike by Hindus and Muslims of Sind. He was a great missionary, mystic, scholar, philologist and poet. Several books in Persian and Arabic on philology and poetry are attributed to him. He was “Lal” (red) because of his red attire, “Shahbaz” due to his noble and divine spirit that soared like a falcon higher and higher in the boundless heavens and “Qalandar” since he belonged to Qalandria order of Sufism and was saintly, exalted and intoxicated with love for eternal being of God. The legend goes that the incumbent fakirs in Sewhan sent him a bowl of milk filled to the brim indicating that there was no room for anything more. But surprisingly, he returned the bowl with a beautiful flower floating on the top. This legend spread far and wide by the time of his death in 1274, after living a good span for 97 years. The shrine around his tomb, built in 1356, gives a dazzling look with its Sindhi kashi tiles, mirror work and two gold-plated doors – one donated by the late Shah of Iran, the other by the late Prime Minister Zulfikar Ali Bhutto. The inner sanctum is about 100 yards square with the silver canopied grave in the middle. On one side of the marble floor is a row of about 12 inch high folding wooden stands on which are set copies of Quran for devotees to read. On the other side, beside a bundle of burning agarbattis (joss sticks), are rows of diyas (small oil lamps) lighted by Hindu devotees. The Hindus regarded him as the incarnation of Bhartihari, the saintly brother of King Vikramaditya, who is believed to have worshipped Shiva at the venue where Lal Shahbaz’s shrine is situated with all its grandeur and glory. Thousands of devotees flock to the tomb while every Thursday their number stands multiplied. 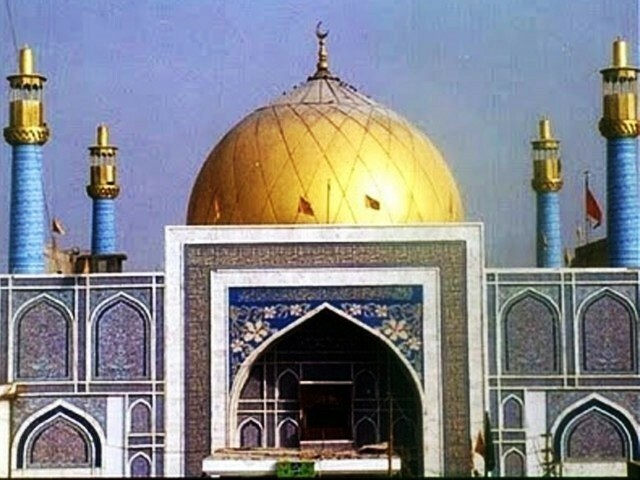 Especially at the time of his “Urs” (death anniversary) being a carnival as well a religious festival and celebrated every year on the 18th day of Shaban, Sehwan springs to life and becomes the focal point of more than half a million pilgrims from all over Pakistan. On each morning of the three day feast, the narrow lanes of Sewhan are packed to capacity as thousands and thousands of pilgrims, fakirs and devotees make their way to the shrine to commune with the saint, offer their tributes and make a wish. Most of the people present garlands and a green chadar (a cloth used to cover a tomb) with Qurâ€tmanic inscriptions in silver or gold threads. Humming of verses, singing and dancing in praise of the saint continues till late at night. A devotional dance known as “dhamal”, being a frenzied and ecstatic swirl of the head and body, is a special ritual that is performed at the rhythmic beat of the dhole (a big barrel-shaped drum), some of them being of giant size and placed in the courtyard of the shrine. Bells, gongs, cymbals and horns make a thunderous din, and the dervishes, clad in long robes, beads, bracelets and colored head-bands whirl faster and faster in a hypnotic trance, until with a final deafening scream they run wildly through the doors of the shrine to the courtyard beyond. As it has been stated in the biography section, Lal Saeen(RA) was originally from Marwand Shareef; that is now in part of Afghanistan , near the border of Iran . However, we couldn’t find ample material in the course of Lal Saeen’s spiritual journey to Sehwan Sharif. However, we can identify from history (-) that he visited several places in Indian subcontinent, parts of Iran , Iraq and Hijaz ( Mecca and Medina ). Many historians believe that he paid a holy visit at the Shrine of Hazrat Imam Ali Reza (AS) the son of Hazrat Imam Musa-e-Kazim (AS). He performed pilgrimage in Mecca and visited Medina Munawwara: the holy shrine of Holy Prophet’s (SAW). During this course he visited Karbala Mualla: Hazrat Imam Hussain (AS)’s holy shrine and came to Baghdad Shareef (current capital of Iraq ); and met Hazrat Ibrahim(R.A) by whom he took Baiat (Reference). In other words Hazrat Ibrahim R.A)became his Shaikh. By his spiritual guidance Lal Saeen came to Sindh, spread the message of love, equality and truth; and met several saints of that time. One thing we forgot to mention is his companion from Baghdad was Hazrat Ali Sarmast (RA), a holy saint whose shrine is in Sehwan Sharif besides the shrine of Hazrat Lal Saeen (R.A). He accompanied him during the holy journey and in every step served him with devotion. From Baghdad , he travelled to Makran and stayed sometime in Panj-Kor (area near/in Makran). Because of Lal Saeen’s blessings and holy stay, he becamse renowned and people started knowing his presence, many became Mureeds. That place is still renowned of his stay, even the name of the town is known as “Dasht-e-Shahbaz”. During his time in Panj-Kor, many people became enlightened and embraced Islam by his teachings, and life style. Every year in the eve of annual death anniversary (Urs Mubarak), caravan of people from Makran visits Sehwan Shareef and pay respect with deep devotion, and great zeal perform holy Dhamal (Sufi Dance). After coming to Sindh Hazrat Lal Saeen’s first destination was Multan , where he met Hazrat Bahauddin Zakaria Multani (RA) and stayed sometime there. Hazrat Bahauddin Zakaria (RA) was one of three friends of Hazrat Lal Shahbaz Qalandar (RA). In arabic the word Genealogy means Shujra-Nasb. This page presents the Shujr-Nasb of Hazrat Lal Shahbaz Qalandar(R.A). There are many books written on the life of Hazrat Lal Shahbaz (R.A) and each presents shujra-nasb with some difference, but in every book it is evident that his lineage links to Hazrat Imam Jafar Sadiq(R.A) who is fifth descendent of Hazrat Syedena Ali (A.S). The genealogy below has been taken from Tarikh Tohfatul-Karam.